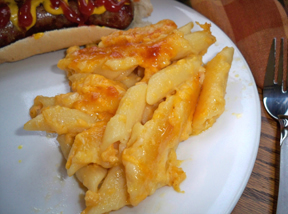 This macaroni and cheese is the ultimate. Creamy and delicious. Serve with broccoli or fresh garden peas to add some color. 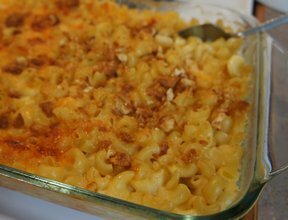 Preheat oven to 350 degrees F. Spray a large casserole dish with nonstick cooking spra. 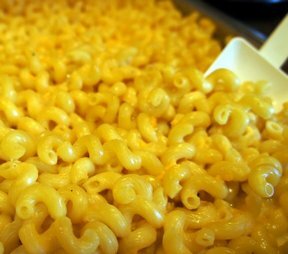 Cook macaroni according to package directions until al dente, about 10 minutes; drain. Place pasta back into pan and add all the cheeses. In a medium bowl, whisk the sour cream, butter, eggs, salt, pepper, milk and garlic. Add to the macaroni mixture and stir to combine. 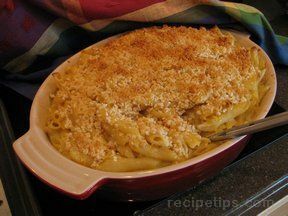 Pour macaroni mixture into prepared dish. In a small bowl combine breadcrumbs and butter. Top pasta with this mixture. Bake for 30 to 45 minutes or until golden brown. "I doubled this recipe because it seemed like so much work and so many ingredients to only have such a small amount. It was time consuming. It might have dried out as I tried keeping it warm in the oven while the rest of dinner was cooking The next time I try this, I'll try to serve it faster. The taste was ok. I didn't find it creamy. The double recipe filled a 13×9 dish. I'll probably add more milk to it when I heat the leftovers." "This is delicious! And so easy. No need to heat the milk which sometimes causes a gritty texture. The garlic adds a little something extra. I might add a little hot pepper sauce next time for a little heat. Great the way it is! Take the time to shred your own cheese, it makes a world of difference."